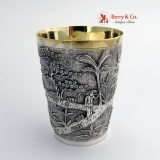 Chinese Export sterling silver double walled beaker with beautiful chased landscape and people decorations, c.1890, unmarked but carefully tested and guaranteed to be as represented. This beautiful cup is 2 1/4" in diameter 3" tall and weighs 76 grams or 2.4 ozs Troy. The excellent original condition and clear detail, with no removals, repairs or alterations, make this an especially attractive offering. 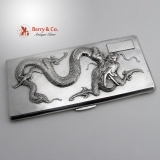 Chinese Export sterling silver cigarette case with high relief Repousse dragon, c.1900. This beautiful cigarette case is 6 7/8" long, 3 1/4" wide and weighs 221 grams or 7.1 ozs Troy. The soft, warm, original finish is present, with no buffing or machine polishing. The excellent original condition and clear detail, with no removals, repairs or alterations, make this an especially attractive offering. American sterling silver Repousse tea ball by Gorham Silversmiths, c.1890. This beautiful ball is 1 5/8" in diameter and weighs 22 grams. The excellent original condition and clear, crisp detail, with no monograms, removals, repairs or alterations, make this an especially attractive offering. The soft, warm, original antique finish is present, with no buffing or machine polishing. 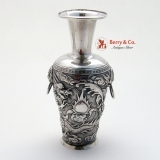 Chinese style silver vase decorated with fighting dragons, applied lion mask faces with ring handles, c.1900. Unmarked. 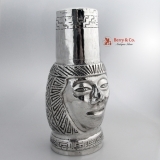 This beautiful vase is 4 5/8" tall and weighs 74 grams or 2.4 ozs Troy. The excellent original condition with no removals, repairs or alterations, make this an especially attractive offering. The soft, warm, original finish is present, with no buffing or machine polishing. 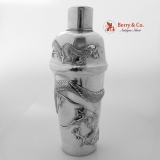 Chinese Export silver cocktail shaker with two applied dragons, Sing Fat, c.1890. This impressive shaker is 8 7/8" tall, 3 1/2" in diameter and weighs 355 grams or 11.4 ozs Troy. The excellent original condition with no removals, repairs or alterations, make this an especially attractive offering. The soft, warm, original finish is present, with no buffing or machine polishing. Chinese Export set of 6 cordial cups with applied Dragon decorations, Sing Fat, c.1890. 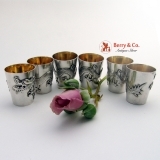 These beautiful cups are 1 5/8" tall, 1 3/8" in diameter and weigh a total of 175 grams or 5.6 ozs Troy. The excellent original condition with no removals, repairs or alterations, make this an especially attractive offering. The soft, warm, original finish is present, with no buffing or machine polishing. 18th Century Russian beaker with foliate and scroll embossed decorations, Moscow, c.1745. This beautiful cup is 3 1/8" tall, 2 5/8" in diameter and weighs 79 grams or 2.5 ozs Troy. The excellent original condition with no removals, repairs or alterations, make this an especially attractive offering. The soft, warm, original finish is present, with no buffing or machine polishing. Peruvian 900 solid silver hand made hand chase figural cocktail shaker, c.1930. This whimsical cocktail shaker is 8 1/2" tall and weighs 422 grams or 13.6 ozs Troy. The excellent original condition, no removals, repairs or alterations, make this an especially attractive offering. The soft, warm, original finish is present, with no buffing or machine polishing. American sterling silver unusual sardine serving fork with a ball finial, c.1870. Probably George Sharp. 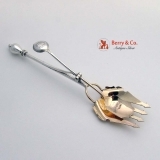 This beautiful fork is 8 1/2" long and weighs 91 grams or 3 ozs Troy. The excellent original condition with no removals, repairs or alterations, make this an especially attractive offering. The soft, warm, original finish is present, with no buffing or machine polishing. American coin silver napkin ring with engine-turned decorations, c.1880. 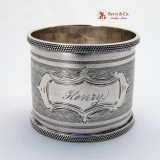 This handsome napkin ring is inscribed Henry and measures 1 7/8" in diameter, 1 5/8" tall and weighs 30 grams. The excellent original condition and clear, crisp detail, with no removals, repairs or alterations, make this an especially attractive offering. The soft, warm, original finish is present, with no buffing or machine polishing. 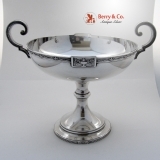 English sterling silver figural goblet trophy inscribed Surrey Union Puppy Show 1892, this unusual goblet bears a full set of Hallmarks for Birmingham 1863. 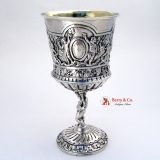 This beautiful goblet is 6" tall, 3 3/8" in diameter and weighs 225 grams or 7.2 ozs Troy. The excellent original condition and clear, crisp detail, with no removals, repairs or alterations, make this an especially attractive offering. The soft, warm, original finish is present, with no buffing or machine polishing. 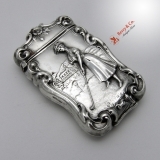 American sterling silver match safe with image of a lady golfer in traditional garb of the era wielding a golf club with a clubhouse in the background, 1903. This beautiful match safe is 2 3/4" long, 1 3/4" wide and weighs 26 grams, the match safe is inscribed JTS Dec 25, 1903. The excellent original condition and clear, crisp detail, with no removals, repairs or alterations, make this an especially attractive offering. The soft, warm, original finish is present, with no buffing or machine polishing. Large and ornate coin silver napkin ring, c.1870. This beautiful napkin ring is 1 7/8" in diameter, 2 1/8" tall and weighs 62 grams or 2 ozs Troy. Monogrammed HL in an ornate period script. The excellent original condition and clear, crisp detail, with no removals, repairs or alterations, make this an especially attractive offering. The soft, warm, original finish is present, with no buffing or machine polishing. 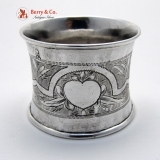 Chinese Export sterling silver double walled napkin ring with beautiful chased landscape and people decorations, c.1890, unmarked but carefully tested and guaranteed to be as represented. This beautiful napkin ring is 1 7/8" in diameter 1 1/4" tall and weighs 32 grams or 1 ozs Troy. The excellent original condition and clear detail, with no removals, repairs or alterations, make this an especially attractive offering. 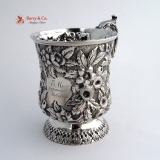 American sterling silver floral repose cup by Welsh & Bro, Baltimore, c.1885. 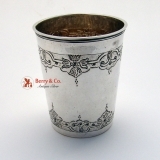 This beautiful cup is 3 3/4" tall, 4 1/2" long across the handle, 3" in diameter and weighs 192 grams or 6.2 ozs Troy. Inscribed E.M from Mother. The excellent original condition and clear detail, with no removals, repairs or alterations, make this an especially attractive offering. 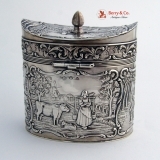 Dutch 830 Standard silver tea caddy with hinged lid, c.1890. 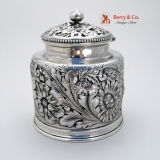 This beautiful tea caddy is 3 1/4" tall, 3 1/4" long, 2 1/8" wide and weighs 143 grams or 4.6 ozs Troy. The excellent original condition and clear detail, with no removals, repairs or alterations, make this an especially attractive offering. American coin silver Architectural napkin ring, c.1850. 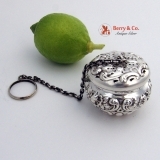 This handsome napkin ring is 2" in diameter, 1 1/2" tall and weighs 53 grams or 1.7 ozs Troy. Monogrammed J Frazier in a period script. The excellent original condition and clear detail, with no removals, repairs or alterations, make this an especially attractive offering. American coin silver large and heavy napkin ring with floral embossed decorations on the body and applied floral embossed rims, c.1860. 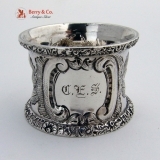 Each of these beautiful napkin rings is 2 1/8" in diameter, 1 1/2" tall and weighs 48 grams or 1.6 ozs Troy and has a period script monogram CES. Monogrammed as described above, the soft, warm, original finish is present, with no buffing or machine polishing. The excellent original condition and clear detail, with no removals, repairs or alterations, make this an especially attractive offering. We have two of these very special napkin rings. The price is for one. American sterling silver Arts and Crafts hand made and hammered water pitcher, c.1910 - 1930. 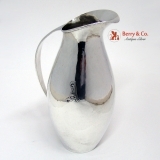 This stunning pitcher is marked only sterling, but is obviously made by a skilled silversmith. Having a period applied monogram: A, this useful and desirable pitcher is 11 1/2" tall, 6 1/4" in diameter and weighs 870 grams or 28 ozs. Troy. Monogrammed as described above, the soft, warm, original finish is present, with no buffing or machine polishing. The excellent original condition and clear detail, with no removals, repairs or alterations, make this an especially attractive offering. 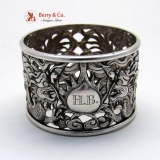 Russian 84 standard silver engraved napkin ring assayed in St Petersburg, c.1895, maker′s mark partially rubbed. 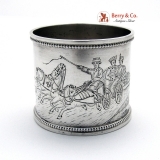 This elegant Troika napkin ring features a Trekh Loshadey or three horse driven carriage with Vodital i Dva Passazhra or a Driver and Two Passengers. In effect, it is a double Troika, with three horses and three people. The engraving is crisp and very nicely detailed and shows the carriage being driven down a country road with houses in the background and fields in the foreground. The engraving surrounds a large, blank Aesthetic cartouche. Weighing 37 grams or 1.2 ozs. Troy, this very desirable napkin ring is 1 15/16" in diameter and 1 5/8" tall. The soft, warm, original finish is present, with no buffing or machine polishing. The excellent original condition and clear, crisp detail, with no monograms, removals, repairs or alterations, make this an especially attractive offering. 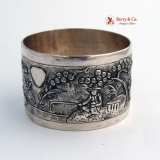 Russian 84 standard silver engraved Aesthetic napkin ring by Ivan Alexeevich Sveshnikov, having a Moscow town mark for 1870, makerâ€²s mark Ð˜ÐÐ¡ (IAS Latin Letters). This elegant napkin ring features Aesthetic floral, foliate and geometric engravings surrounding a blank apple shaped cartouche. Weighing 35 grams or 1.1 ozs. Troy, this desirable napkin ring is 2" in diameter and 1 1/2" tall. The soft, warm, original finish is present, with no buffing or machine polishing. The excellent original condition and clear, crisp detail, with no monograms, removals, repairs or alterations, make this an especially attractive offering. 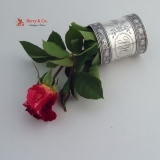 We have the companion to this napkin ring listed on the website. Item # N1380. Chinese export sterling silver open work double dragon napkin ring by Wo Shing of Shanghai, China, c.1870 - 1890. This fabulous figural napkin ring features twin cut work dragons floating in the clouds surrounding a teardrop shaped cartouche containing the period monogram: HB. 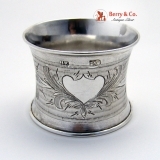 Weighing 24 grams, this extremely desirable napkin ring is 1 7/8" in diameter and 1 1/4" tall. Monogrammed as described above, the soft, warm, original finish is present, with no buffing or machine polishing. The excellent original condition and clear detail, with no removals, repairs or alterations, make this an especially attractive offering. Cuban sterling silver snuff spoon, marked COPA DE ORO (Cup of Gold) and inscribed on the extremely wide handle, in period script: Havana, c.1890 - 1910. One of the more unusual pieces we have found, this souvenir type spoon is somewhat of a mystery. We can find no reference to anything like it. The spelling of Havana indicates that it would have been made for the tourist trade, the size of the bowl is unusual and the width of the handle relative to the length of the spoon is most unusual. We call this a snuff spoon as we cannot think of another practical use. 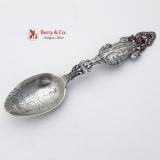 The handle has wiggle work engraving along the front of its perimeter and the spoon is 4 1/2" long, the handle is 1 1/6" wide, the bowl is 7/8" long and 5/8" wide, with the spoon weighing 12 grams. Inscribed as described above, the soft, warm, original finish is present, with no buffing or machine polishing. The excellent original condition and clear detail, with no removals, repairs or alterations, make this an especially attractive offering. American sterling silver footed compote in the Landsdowne pattern by Gorham Silversmiths, c.1917. This exquisite and very scarce pedestal base serving bowl has large shaped handles and is 7" in diameter, 7 1/4" tall to the handle tops, 6" tall to the bowl rim, 9 3/8" across the handle and it weighs 514 grams or 16.5 ozs. Troy. The bowl is 2 1/4" deep. The Gorham lion anchor G, sterling and the pattern number A10078 marks are located under the bowl inside the pedestal. We will try to get a picture of the marks, but they are very difficult to photograph. The soft, warm, original finish is present, with no buffing or machine polishing. The excellent original condition and clear, crisp detail, with no monograms, removals, repairs or alterations, make this an especially attractive offering. 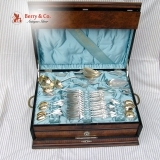 American coin silver large complete 84 piece dinner and luncheon size set in the Comstock pattern by Vanderslice, pat. 1874. This magnificent set consists of: 12 Dinner Forks 8" 12 Luncheon Forks 7 1/8" 12 Table Spoons 8 1/2" 12 Dessert Spoons 7 1/4" 12 Teaspoons 6" 12 Demitasse Spoons 5 1/8" Servers Include: 1 Soup Ladle 12 7/8" 1 Gravy Ladle 7 5/8" 1 Berry Scoop 9 5/8" 1 Pie Server 9 1/4" 1 Mustard Ladle 5 3/4" 1 Sugar Spoon 6" 1 Pickle Fork 6 1/4" 1 Pickle Knife 7" 2 Master Salt Spoons 3 3/4" 2 Master Butter Knives 7 1/4" (90 degree twist handle) Total silver weight is 3526 grams or 113.4 ozs Troy. Each piece has a crest of a fox head. The soft, warm, original finish is present, with no buffing or machine polishing. The excellent original condition and clear, crisp detail, with no monograms, removals, repairs or alterations, make this an especially attractive offering. American sterling silver and copper souvenir spoon of an Eskimo Woman and her child sitting on her shoulders, both with copper faces and the woman having copper hands by Mayer Brothers of Seattle, Washington and retailed by S & H Jewelers of Nome Alaska, c.1895. The tip of the Mothers′ nose has a little wear, to be expected on an Eskimo.. The detail on this spoon is fantastic and the fact that it was sold in Nome Alaska adds to its appeal. The bowl features an engraved scene of two Alaska miners and their cabin, with one miner sitting on the porch smoking his pipe and the other standing next to him holding a gold nugget in the air. The mountains in the background complete the scene. This very special spoon is 5 5/8" long and weighs 32 grams or 1+ oz. Troy. The soft, warm, original finish is present, with no buffing or machine polishing. The excellent original condition and clear, crisp detail, with no monograms, removals, repairs or alterations, make this an especially attractive offering. American sterling silver and multicolored enamel souvenir spoon by Thew Watson Company, c.1900. 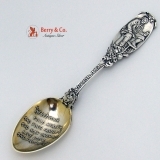 This ornate New Orleans spoon has an scrolling embossed bordered bowl with a hand painted scene of 7 cotton pickers working in the field and NEW ORLEANS, LA. in the sky in the background. The front of the handle has Seal of the City of New Orleans above a portrait of Old Hickory over a New Orleans banner with the Robert E. Lee Monument below. The back of the handle has he State Capitol building atop a Creole Cottage with The Jackson Monument below. The main attraction of this highly desirable spoon is the nicely detailed enamel bowl, which has no damage to the enamel. Weighing 37 grams or 1.2 ozs. Troy, this spectacular spoon is 5 7/8" long. The soft, warm, original finish is present, with no buffing or machine polishing. The excellent original condition and clear, crisp detail, with no monograms, removals, repairs or alterations, make this an especially attractive offering. 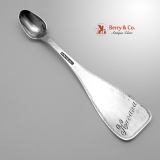 Offered elsewhere for $1195, our price of $950 is as special as the spoon itself. American sterling silver souvenir spoon of Joseph Jefferson by The Howard Sterling Company. c.1900 having an embossed bowl with the marvelous toast: Hereâ€²s your good health, and your familyâ€²s, and may they all live long and prosper. Weighing 36 grams or 1.2 ozs. Troy, this desirable spoon is 6" long. The soft, warm, original finish is present, with no buffing or machine polishing. The excellent original condition and clear, crisp detail, with no monograms, removals, repairs or alterations, make this an especially attractive offering.